Dubai: A driverless vehicle will be on a month-long trial on Mohammad Bin Rashid Boulevard in Downtown Dubai from Thursday, the Roads and Transport Authority (RTA) said on Wednesday. A joint venture between RTA and Emaar Properties, the trial run is part of Dubai’s attempt to adopt smart mobility solutions in its attempt to become the smartest city in the world. Built jointly by Omnix International and Easy Mile, the autonomous vehicle dubbed EZ10, is an electric shuttle that can run in both directions as it has no specific front or rear. Running on a 700-metre trial route that will begin from Mohammad Bin Rashid Boulevard/Financial Centre Street intersection to Vida Hotel Downtown Dubai, the driverless vehicle will provide free rides to all commuters. 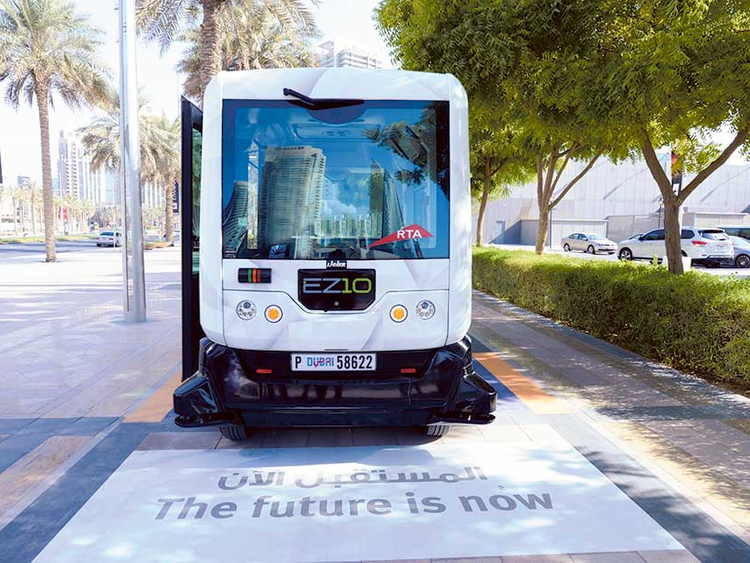 The first driverless vehicle to be on trial in Dubai, EZ10 is expected to connect Burj Khalifa, Dubai Mall, Dubai Opera and Souq Al Bahar with several other locations in Downtown in the next phase. Mattar Al Tayer, director-general and chairman of the Board of Executive Directors of RTA, said the trial run of the smart vehicle is phase one, with more to come. “This experiment is part of the RTA’s plan to test driverless transit technology under the climatic environment of Dubai. Through this trial RTA intends to educate the public about autonomous cars technology,” said Al Tayer. He added that the experience is the first step in implementing the driverless mobility strategy launched by His Highness Shaikh Mohammad Bin Rashid Al Maktoum, Vice-President and Prime Minister of the UAE and Ruler of Dubai. The strategy aims at switching 25 per cent of total mobility in Dubai to driverless journeys using various transit means by 2030. Capable of moving at a speed of up to 40km/h, EZ10 cruises at 25km/h and is ideal in pedestrian areas and dedicated cycle lanes. The vehicle is also special needs-friendly, with a movable ramp allowing access to wheelchair-bound passengers. EZ10 is mainly targeted to cover the last mile where conventional means of transportation are not relevant but at the same time distances are too long to walk. Among the advantages of EZ10 is that unlike the tram and metro it does not need infrastructure to operate. Though it follows a route, also called virtual route, it can be re-routed at will. The smart system of the vehicle takes around 90 minutes to map and memorise a route and then it runs on it without any human interference. “The vehicle travels on virtual routes, which can easily be reset to accommodate sudden changes as required. The vehicle is fitted with all safety requisites and controls specifying its planned route. The sensors and the intelligent technology of the vehicle enables it to tackle any obstacles encountered on the route to avoid collision,” said Al Tayer. The battery-powered vehicle can run up to four hours with AC on a single charge, while without AC it can run up to 10 hours. The system can detect obstacles and interact with objects at 360 degrees. The vehicle has a rooftop navigation system, equipped with two laser sensors and a GPS sensor. Sensors and cameras are equipped on all four corners of the vehicle with 270 degree vision. The vehicle is equipped with a 15Kv battery and is four metres long and two metres wide. It requires a three-metre wide space to operate and can detect an obstacle up to 40 metres away. He said that Emaar seeks to connect various Dubai Downtown landmarks through the driverless transportation system. He added that the smart shuttle is also likely to be used at its future project, Dubai Creek Harbour. The driverless vehicle was first unveiled in Dubai at the UITP Mena Congress earlier this year. The vehicle is already on trial in some European cities and last week Singapore launched a trial on a much smaller driverless taxi.